Today at lunch, Chris the Radio Guy will be receiving his Skirt Poem. 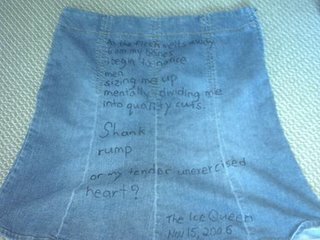 I am quite pleased with how it turned out and may turn Denim Skirt Poems® into a new sideline career.Who'd like to buy a Denim Skirt Poem®? Jean Poems® also available.